MIK (prevero)’s BI suite is based on a 3-tier architecture including database, application server and clients. The vendor’s proprietary multidimensional OLAP database prevero.ARJUNA, a Microsoft .NET development, is included for data storage. prevero.STARLIGHT provides two different clients for end users: A Microsoft Silverlight-based web client and an Excel add-in called prevero.XYLONA. User interfaces for administration and prevero.ETL are provided with installed clients. prevero.STARLIGHT is a flexible, graphical development environment for creating tailor-made BI solutions. The product is targeted at business power users who build BI applications with the help of wizards in a self-service manner. Access to applications is typically web-based. The well integrated suite provides functionality for creating screen-oriented reporting, OLAP analysis, individual dashboarding and planning applications. Consequently, a wide variety of different BI use cases can be addressed with prevero.STARLIGHT. Furthermore, more than 100 business functions are available as standard in the product (e.g. periodic accumulation, weighted average, relative deviation etc. ), which can be executed in the database and integrated with the prevero.STARLIGHT user interface. 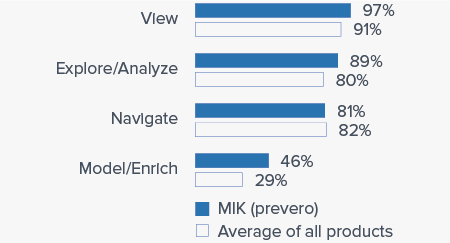 The main use cases for MIK (prevero) are basic data analysis (typically OLAP analysis), standard/enterprise reporting, ad hoc query and budgeting/planning. Dashboards/scorecards and advanced analysis are on the roadmap for many customers in the future. Only eight percent of employees in customer organizations use MIK (prevero) – compared to the survey average of 17 percent. This reflects the fact that the product is particularly geared to business power users with its broad functionality for various BI and planning tasks, rather than being a product for the masses. MIK (prevero) targets mid-sized companies and large corporations across all industries. 65 percent of our sample of MIK (prevero) customers come from mid-sized companies (100-2,500 employees) with a median of 100 users. However, the mean of 520 users indicates the product is capable of supporting larger implementations. BARC’s Vendor Performance Summary contains an overview of The BI Survey results based on feedback from prevero company MIK users, accompanied by expert analyst commentary.